The hamlet of Newby Cote, on the old road between Clapham and Ingleborough, has very limited parking at the junction of the lane to Newby. This route is probably one of the least used of the main paths up Ingleborough, and much of it is on feint or even invisible paths, so confidence in navigation is needed, especially in poor visibility. There is no huge interest in the terrain, save for a few interesting boulders, including Harry Horse Stone that was the subject of introspective debate by Alfred Wainwright, and some impressive shake holes. Long Kin West Pot and Fluted Hole provide some limestone variety to the relentless moorland, but are almost a kilometre off route to the West. Follow the track opposite the junction with the Newby lane, which passes a farmhouse on the right before leading to a walled old quarry track. Beyond a gate, the track leads to open country, curving to the right. Leave the track, keeping a wall to your left. At the wall corner, head up a just-discernable path straight up the hillside, crossing sometimes boggy moorland. Fine views can be had to the right of Pen-y-ghent in the distance, and soon the contentious location of Harry Horse Stone. Wainwright expected the stone, marked among many boulders on the OS map, at least to have some equine resemblance. What he found instead was a very ordinary, square-ish block. However, 250m further up the hillside is a much more distinctive rock which, from certain angles, could be seen to resemble an animal. 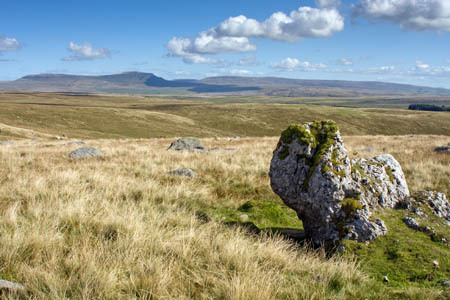 From the stone, regain the feint path and head up an occasionally cairned route to Little Ingleborough. A 200m diversion can be made to the left to visit a solidly made cairn just below the shoulder of the spur. Head back on to the summit of Little Ingleborough, joining the main, maintained path leading up from Clapham and Gaping Gill. Navigation eases as the path leads diagonally up the final summit slope of Ingleborough itself. Hit the summit and make a beeline up the gentle sloping plateau to the cross shelter.